Shostakovich’s relationship with Stalin was complex and has been the subject of debate. Amazingly, in spite of constant state censorship, the spirit of darkness permeating the music is evident, often in the form of irony. For example, the final movement of the famous Fifth Symphony concludes with seemingly triumphant and celebratory fanfares in the heroic key of D major. Many conductors have taken this music at a fast clip-about 188 eighth notes per minute. But there is speculation that Shostakovich actually intended it to go much slower. Listen to contrasting tempos of this ending here. You’ll notice that in the slower tempo the music sounds empty and hollow, providing only a veneer of celebration. Called upon to commemorate the Russian victory over Nazi Germany with his Ninth Symphony, Shostakovich delivered music which was light and frivolous. It was quickly censored by Soviet authorities. Premiering on December 17, 1953, Symphony No. 10 in E minor, Op. 93 was Shostakovich’s first symphony following Stalin’s death. Some listeners hear the darkness and terror of the Stalin years fully expressed for the first time in this work. Let’s listen to a live 2009 performance of the Tenth Symphony by Mariss Jansons and Amsterdam’s Royal Concertgebouw Orchestra. As you listen, consider the atmosphere the music evokes. How do harmonies elicit emotion? Do the sounds of the instruments suggest distinct personas? The first movement grows out of the eerily quiet depths of the low strings. What happens as the music develops? Let’s go back and listen one more time. From the opening of the first movement, you probably sensed something frightening, maybe even menacing…a sense of dread and foreboding. We’ve all had the experience of fixating on something we find disturbing and experiencing an almost physical reaction. The more we think about it, the more anxious and worked up we get. For me, this first movement unfolds in a similar way. Slowly, in stages it gets increasingly wound up, along the way capturing a sea of indescribable and complex emotions (2:17, then 3:20, then 4:11). At 5:55 a grotesque waltz begins. Notice the way beats are accentuated in unpredictable ways. It’s anything but graceful. This isn’t Swan Lake. By the time we reach the development section in the middle of the movement, we’re at a completely new level of anxiety, which continues to grow. Notice the way the woodwinds scream out at top volume in the most shrill, high register around 10:41 The motive from the opening bars of the symphony is repeated obsessively (in the low brass at 10:19 and 13:58). A sense of struggle is written into the music. Following 12:14, listen to the way the strings fight against the brass, desperately grasping at a series of notes which lead nowhere. Except for a brief ray of light (20:52), the movement ends as it began. The second movement provides another view of terror. As you listen, consider how the music is flowing. Are we moving towards a goal or just rigidly marching forward towards an increasingly frightening abyss? In the third movement we hear the famous DSCH motive (29:06 and 35:29), which Shostakovich used in many pieces, including the ferocious String Quartet No. 8. In German these pitches, (D, E-flat, C, B), are abbreviated initials for “Dmitry Shostakovich.” With the obsessive repetition of this musical cryptogram, Shostakovich may be suggesting that the spirit of the individual cannot be crushed. The solo horn motive, which is repeated throughout the movement, represents the initials of one of Shostakovich’s female students, Elmira Nazirova (E-A-E-D-A). In the final bars the two motives are heard together. In the final movement Shostakovich gives us an almost silly and slightly sarcastic theme (44:59). We hear hints of this theme gradually taking shape in the preceding Andante (44:19). Notice the return of the DSCH motive (49:27, 52:13, 52:53). Consider how the ending of the final movement relates to the what came before. 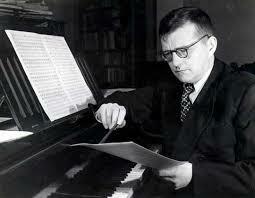 Why do you think Shostakovich chose this type of ending? I’ve offered a few of my thoughts regarding the music. Now go back, listen again and come back with your own ideas. Is there a particular moment in the music which speaks to you in an especially strong way? If you feel inspired, share your thoughts in the thread below. Thanks for this very interesting article with the telling comments from Shostakovitch’s memoires on his Fifth Symphony as well as the interesting and thought-provoking questions. I imagine that IB music teachers might find this article of interest to use in their classes. My name is Irena Kogan Klein. Can I ask you to send this letter to Mr.Solomon Volkov? Maybe someone knows his email ? I am а composer in my profession as a graduate of The Saint – Peterburg Conservatory and a winner of The International Composers Competitions. I remember Solomon from Leningrad.